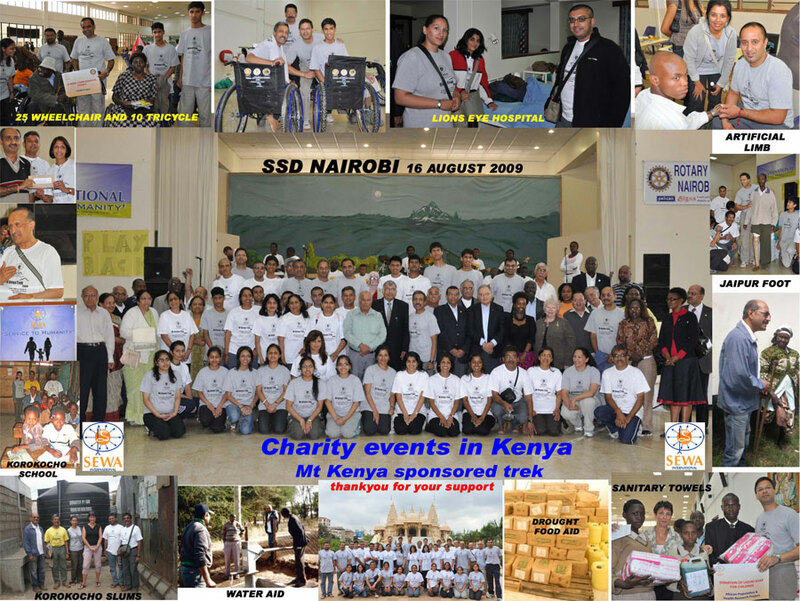 In August 2009, a group of 40+ from the UK tackled Mount Kenya. From the group of 54 from the UK, 49 completed the full rim walk of Mt Longonat which is 14 miles at 2776m. 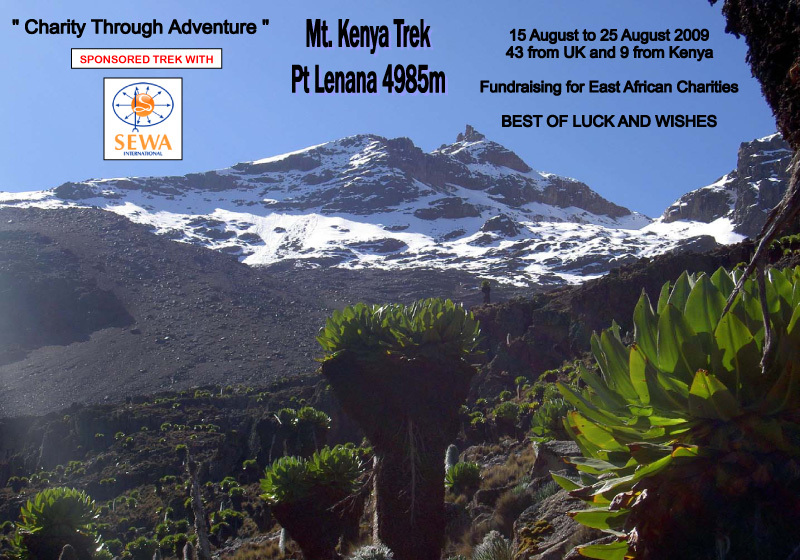 40 of the group summitted Mt Kenya , to Pt Lenana 4985m. The age range of the group was from 14 to 69, 2 retired at Shiptons base camp 4200m. We also attended a big charity presentation with local Hindu community, Rotary Club and local aid benefactors. See reports and comments from participants below, and a photo gallery at the end. 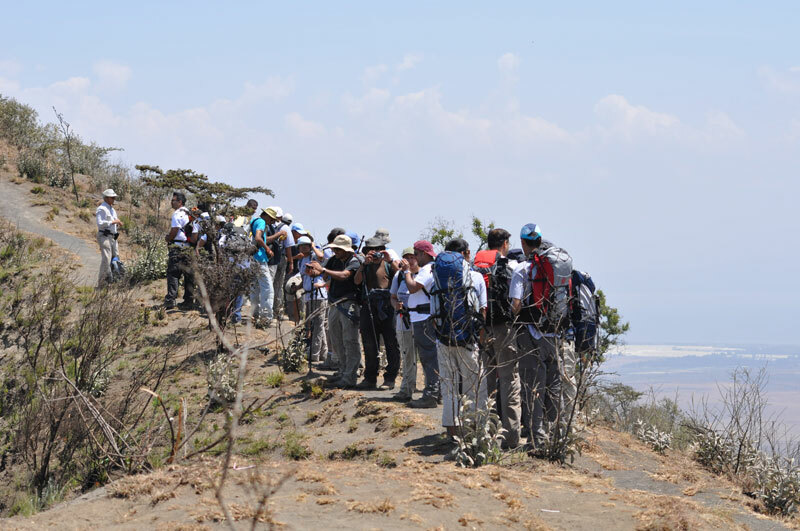 Trek started on 20 August, going up on the Sirimon route and coming down from Naro Maro route. The 5 day and 4 night trek gives a feel of high altitude and have enough time to enjoy the magnificent views. All money raised will go East African charities. Please log on www.justgiving.com under Sewa International Charity and you will see individual fund raising pages and their profile. A Big Thank You to all that donated! On August 23rd I was 4895 meters above Africa… I did it! My journey began in Nairobi at the host’s home. My cousin, Minesh Lad and I instantly were made to feel welcome into this country we had never visited. The trek itself was still a few days away but our itinerary was packed from day one. The charity presentation was very memorable; where we got to see where money previously raised by Sewa International was going to. 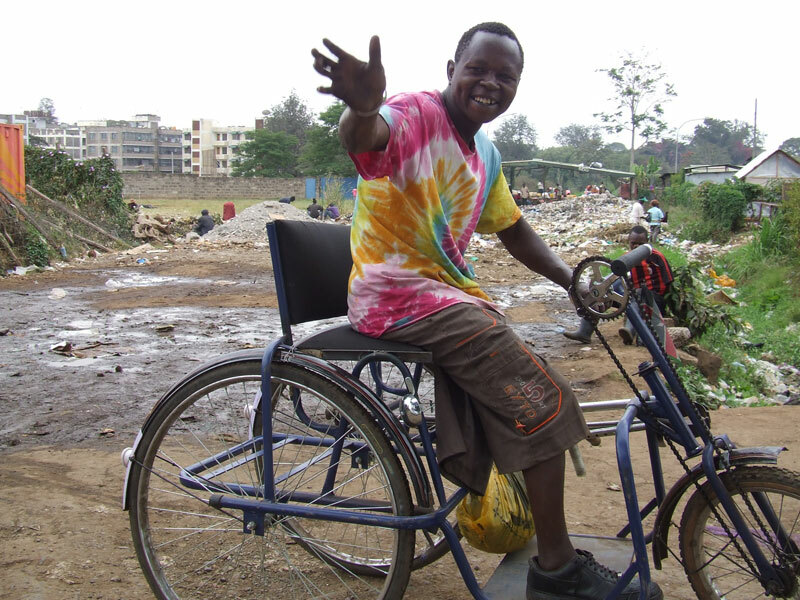 Having the beneficiaries there was also very rewarding, knowing that our donations were going to fantastic causes. After all, besides the personal achievement, this is why we were here. Mt Longonot at 2776m & 14 miles was the next destination as a way of stretching our lungs and legs before the trek. This was a great experience as it was actually my first ‘climb’. I found this challenging to say the least and an overall good experience. This was a chance to meet the rest of the group and bond with my fellow trekkers. Reflecting on my trip, I feel that Mt Longonot did play a part in my success in getting me up Mt Kenya. 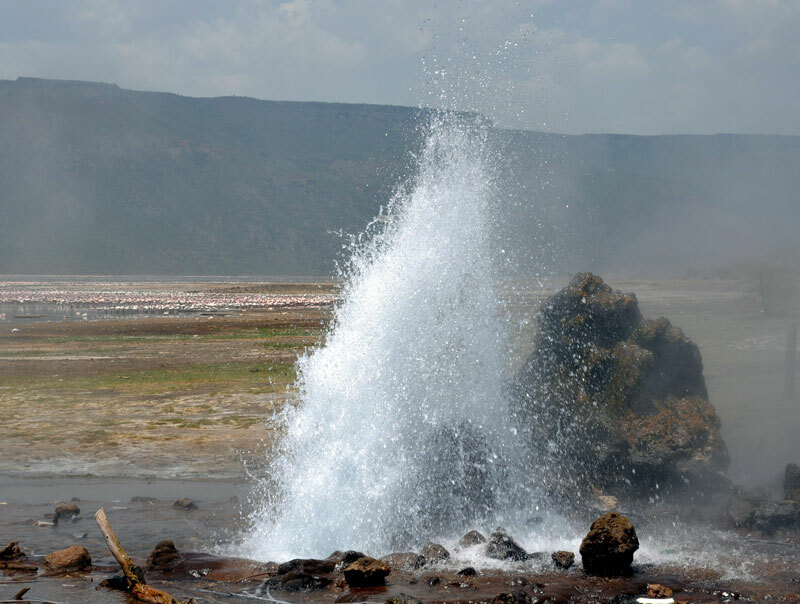 The next few days were spent with visits to Lake Nakuru 1800m and Lake Bogoria, which were both enjoyable and relaxing. The day of the trek had finally dawned upon us and the nerves were starting to kick in. The first day wasn’t too strenuous and not very demanding… surely it can’t be this easy?! We stopped over at the base camp at 3300 meters. Day two is one that Minesh, Gina, Gita, Hitesh, and I will never forget! “The Famous Five” had lost the rest of the group and were battling to reach the next base camp. Weather conditions were relentless as we experienced 5-6 hours of constant rain and hail. Gloves soaked, fingers frozen. We eventually made it to the base camp at around 7:30pm in total darkness, 2-3 hours after everybody else. The group had to send out guides to look for us as we pummeled along following our porter. Luckily, the third day was planned as a break and a chance to acclimatize at 4200 meters. On day four we set out at 5.30am to reach the summit. The whole group was buzzing and the thought alone of reaching the top was enough motivation to get up there! I was part of the first group to reach summit and it was an amazing feeling! A great sense of achievement – I had accomplished what I had set out to do! 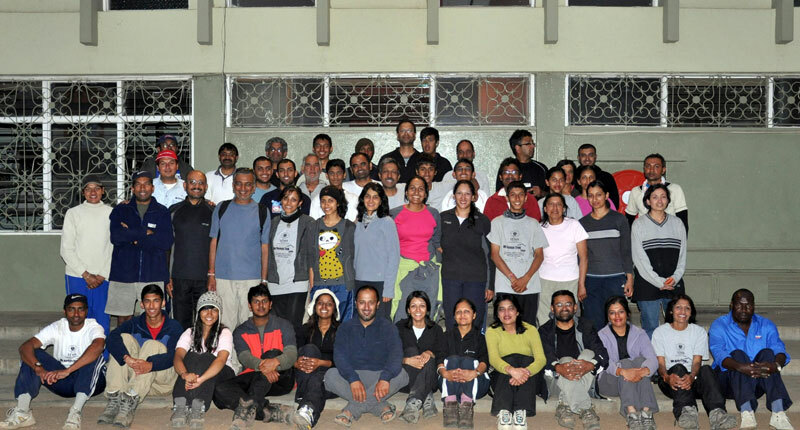 The team had been fantastic throughout the trek and supported each one and other through the toughest time. 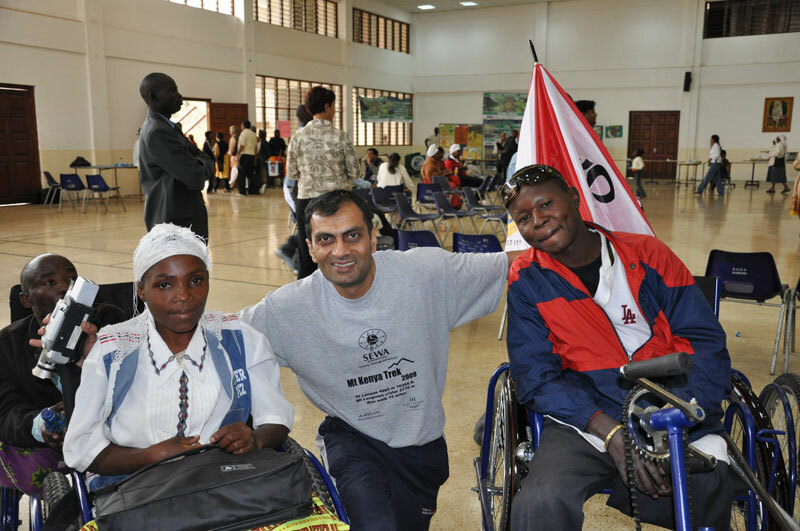 Sewa International had brought a great team with a wealth of experience to organize a fantastic trip! The next few days were spent at the Maasai Mara and it was a great wind down. To see the animals in their natural habitat was an experience I will never forget. The hotel was superb and everybody thoroughly enjoyed it! 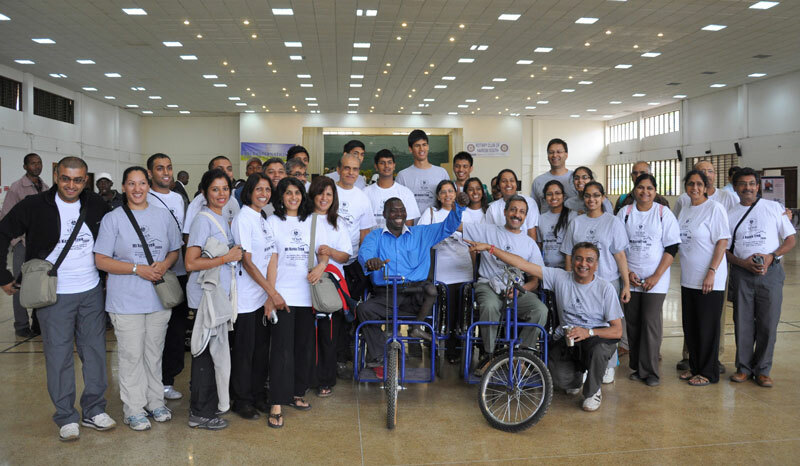 Overall, my experience with Sewa International and the trek in particular was very good. A great deal of time and effort had been put into this trip which has been greatly appreciated by all those who were involved. 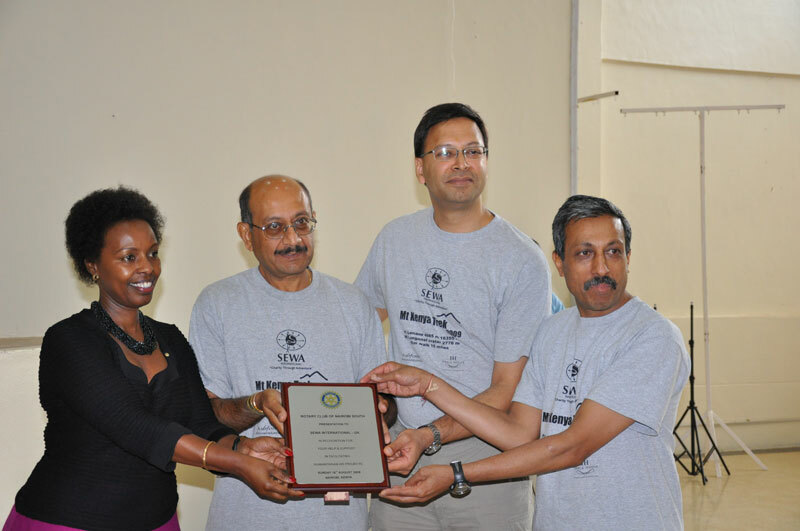 The fund raising had also been a success and the distribution of funds are going to very worthy causes. The climb to Mt Kenya can only be described as amazing! For someone like me who is definitely not an outdoors person and has never even been camping this experience was a first but definitely not the last. Being able to see the charity work that Sewa International undertakes beforehand gave me the strength to make it to the top. The Jaipur Foot project was one which caught my heart and brought tears to my eyes. Seeing a woman being able to walk after 19 years or a man hold a bottle of water with a prosthetic hand was a very humbling experience. 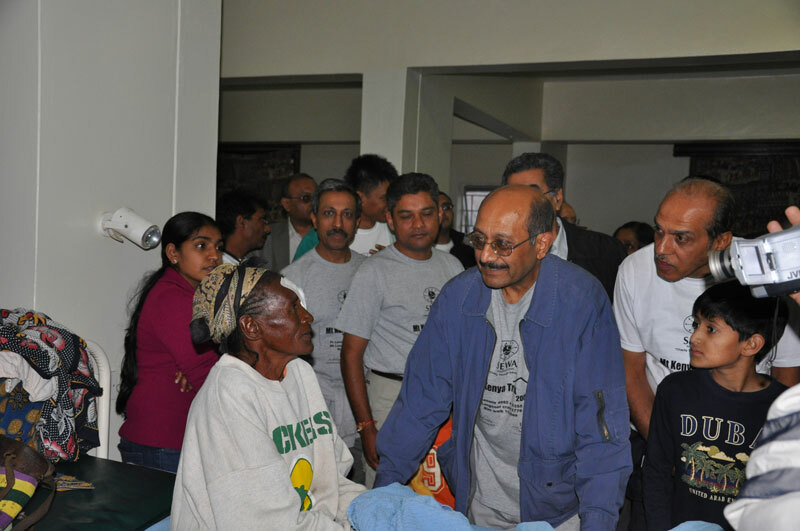 After visiting projects such as this, the Lions Eye Hospital and many more we set-off to climb Mount Kenya. All 42 of us! The first day climb was fun with lots to see along the way and the energy to stop and admire it. We were joined by some people we had met in Nairobi who thought they would keep us company. The second day challenged us all with the crazy weather. It hailed and rained for most of the day and we soon found out that many of our waterproofs weren’t in fact water proof. With two people getting hyperthermia and 5 people getting lost on the mountain the morale wasn’t great that evening. However, Satish and Janesh kept us motivated. The morning of the summit it was quite daunting trekking in the dark with our head torches on but when we got to the top it was the most amazing feeling in the world. I still look at the pictures and think ‘did I really make it? There were times when I thought to myself ‘why am I doing this to myself’ but if you were to ask me now if I would climb another mountain, the answer would be yes, I will…………one day!!!! It’s one of the most satisfying things I have ever done, getting to the top and raising money at the same time. The hardest part of this for me was staying at the camps. But the team was so happy and lively that there were times that I forgot where we were staying. The Nairobi guys were amazing, those that climbed with (and rescued) us as well as those that home hosted us. The hospitality and welcome we had was overwhelming. To have people we had just met helping us so much was such a nice feeling and I hope we can offer them the same welcome one day. They dropped us off and picked us up without even knowing us to begin with. The entire group was brilliant. I only knew a handful of people at the beginning of this trip, by the end I felt I was with family. Once again – thank you so much for this experience of a lifetime! This summer we participated in a trek to Point Lenana on Mount Kenya which at 4985m is the highest non-technical peak on Mount Kenya. 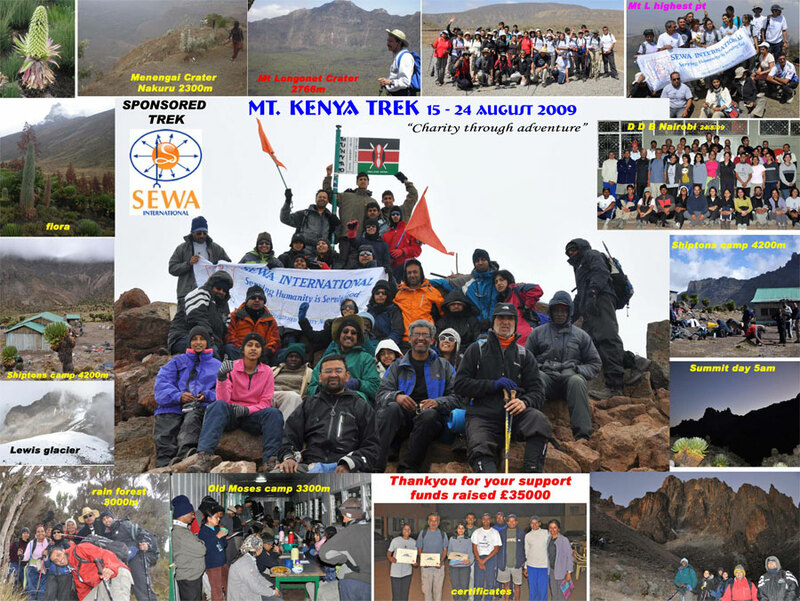 The trek was organised by Sewa International to raise money for various projects in Kenya keeping in line with the tradition of Charity Through Adventure, a project of Sewa International, which involves raising money to be spent on projects in the region the trek is organised e.g. 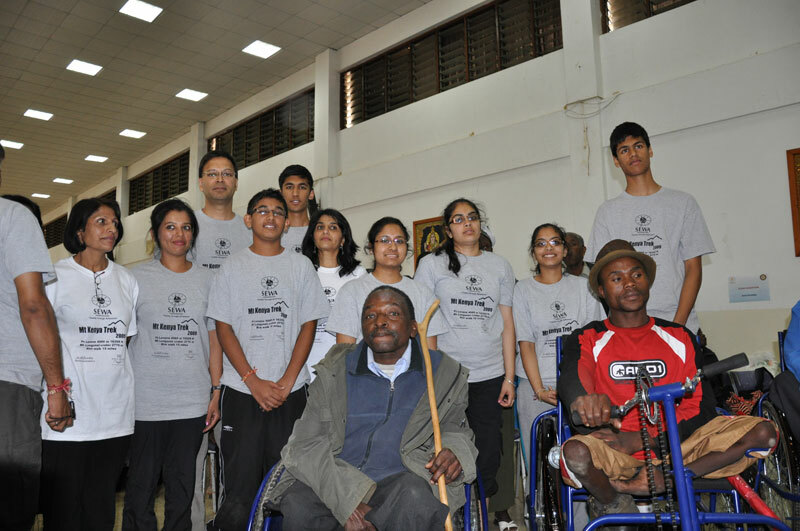 the previous year involved a trek to Stok Kangri in Ladakh and all money raised was donated to projects in Ladakh. 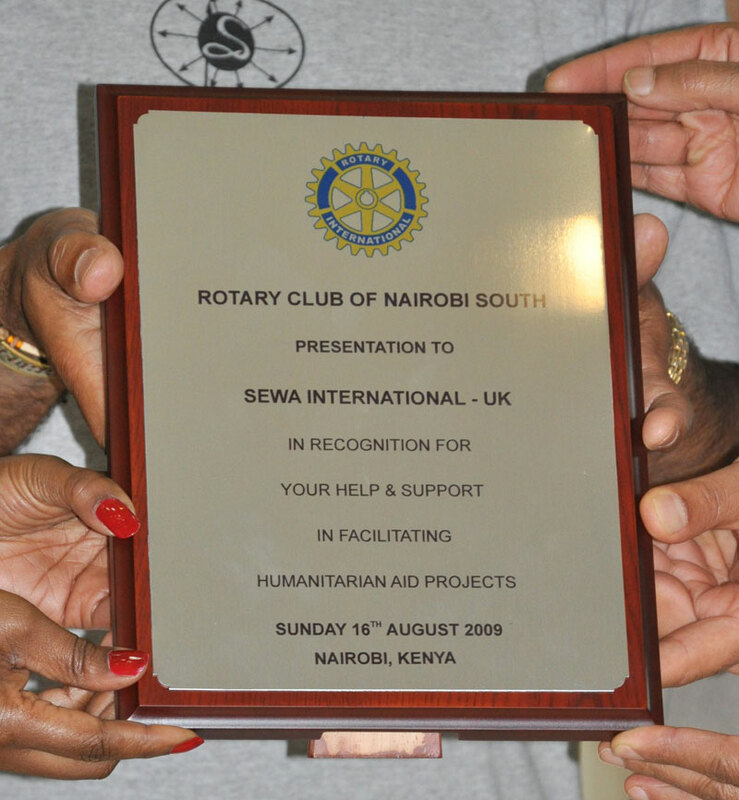 On our first day in Nairobi we saw first hand the difference Sewa was making to the lives to Kenyans from money donated previously. The big day finally arrived when we set off for Mount Kenya. It was a long drive through some dirt tracks to get to the Mount Kenya park gate entrance for the Sirimon route. The first part of the climb was through a well-defined path through the forest. There were 42 of us, all participating to raise money for Sewa International. We woke up to the glorious sight of clear blue skies without a cloud in sight. We could see the peaks of Mount Kenya – although not Point Lenana and there was not a cloud in sight. Little did we know what was to come that day…..
We set off at 8:30 AM and our aim was to get to Shipton’s camp located at an altitude of 4200m. By 10AM it had started to cloud over and by 11AM visibility was poor. By midday it started raining and this was followed by hail. At this point we encountered the “just around the corner” phenomenon. Every time we asked the guide how much further we had to go there was only one answer – just around the corner. I finally got to Shipton’s camp around 5PM. It was just as well that the following day was scheduled for acclimatising. I, by this time, again had a high fever and I decided enough was enough. I went to bed and only got up to briefly have dinner before clambering back into the bed. The following morning we set-off just before 6AM. I needed a rest every now and then – the fever for 2 days had taken a lot out of me. Finally I was within a few meters of the summit. I could hear my son and wife egging me on – at least they had made it to the top. The last few meters seemed really difficult but I clambered over a rock and I was on the summit! Finally after months of planning I had made it. After several practice treks – Snowdon, Yorkshire 3 peaks, Snowdon again, Ben Nevis – I was on Point Lenana. Everyone had supported and helped each other and had a wonderful time. The trek has so far raised £33,000. It was an amazing experience. We had a fantastic time. I was a bit nervous going out there as we had not really prepared ourselves and but had an outstanding experience. We did encounter tough times but overcame all difficulties as the guides and porters were good companions and made us feel comfortable about the challenge and looked after our needs well. The Group made a great team, we met great people, had amazing views, we surprised ourselves as to what we can actually achieve and we had a trip of a lifetime.